Usually the dog house is seen as a bad thing. But not for these pups. Seriously, what do I have to do to get access to one of these things? I just hope they can appawciate their lavish lifestyle, because not all of us get to live this way. 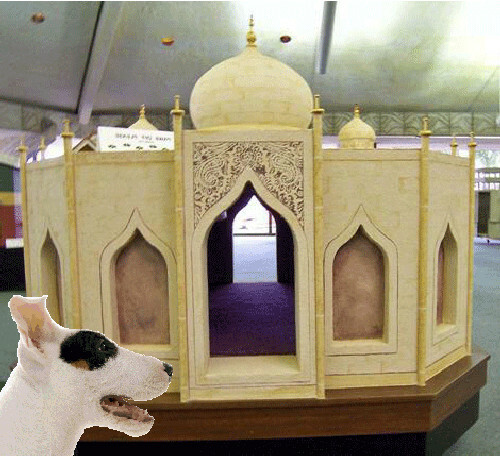 Time to emBark on a tour of luxurious dog houses, guided by the miniature bull-terrier with maximum personality: Spot. Our first home on the tour is a $30,000 luxury hacienda in Los Angeles, California. 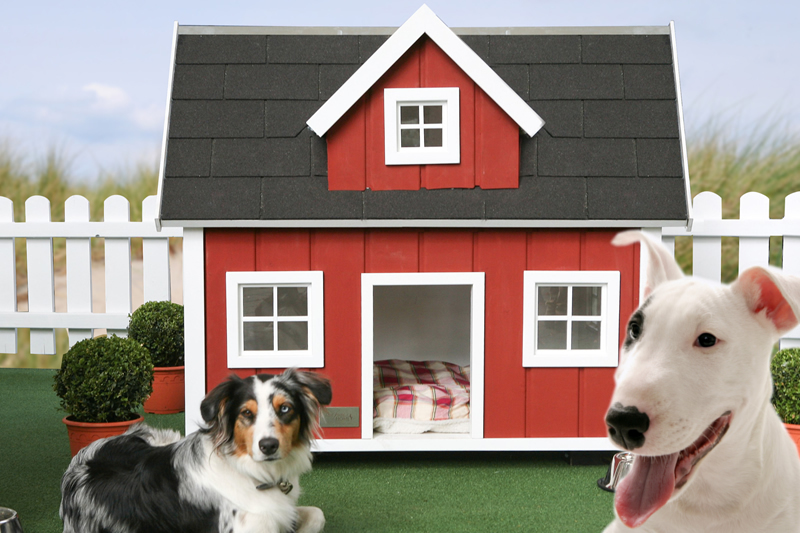 Everything in this dog house is custom, from the terra cotta flooring to the red-clay tiled roof. Each turret of the house contains a tiled lounge space that remains cool during warm, sunny days. The hoomans only wish they could squeeze through the front door. 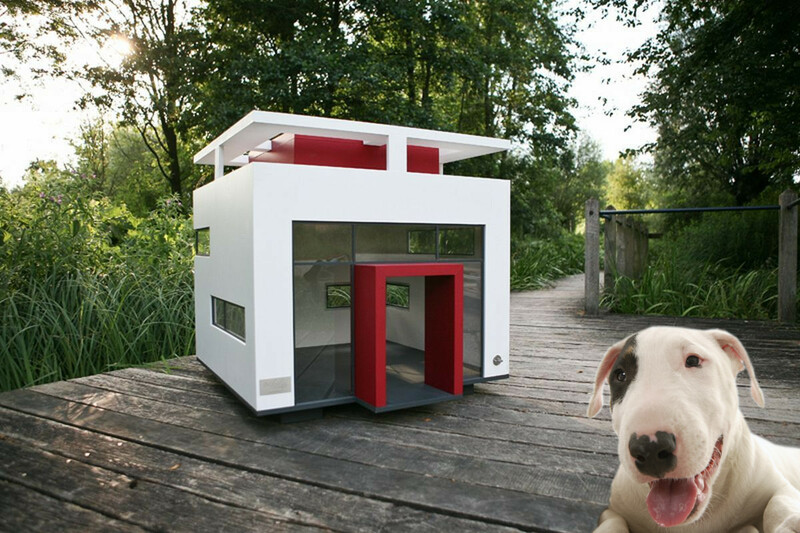 This German-manufactured modern dog house is a homage to Bauhaus architecture. The builders adopted the Bauhaus approach to design: identify the user’s needs and then scientifically develop a dwelling that addresses them. The result is a simple house with clean lines made of durable–and easy to clean–materials. It features a skylight that admits natural light and a plexiglass front wall that allows the dog to remain shielded from the elements while keeping watch over their surroundings. Those are some classy german dogs enjoying the perfect unison of form and function. 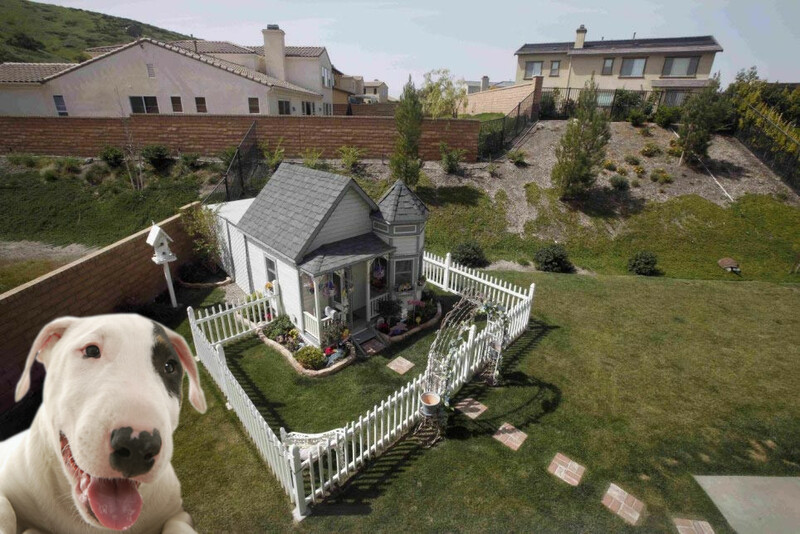 This Victorian-style doggie mansion cost a cool $20,000 to build. 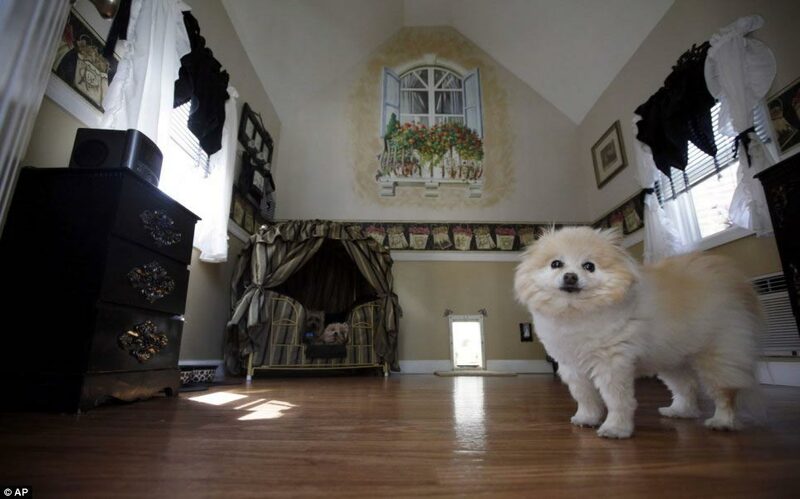 It’s home to three fabulous dogs, Chelsea, Darla, and Coco Puff. The home is a smaller version of the owner’s historic Victorian home. She commissioned the project after an owl almost kidnapped one of her Pomeranians. The structure is large enough that she can enter and visit her canine neighbors. Inside, the dog house has hardwood floors and vaulted ceilings. Each dog has it’s own luxury dog bed. The wallpaper and curtains are all custom made. Do you see the doggie door? 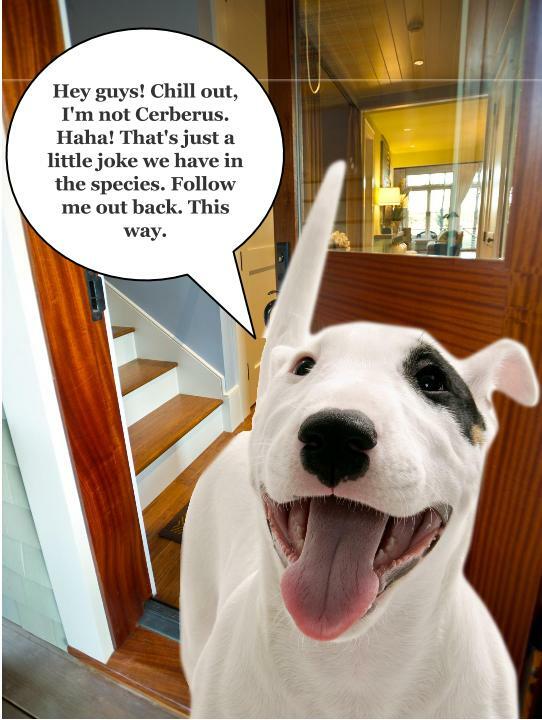 It’s a private entry and exit for the canine residents. No hoomans allowed! And, of course, the house is surrounded by a white picket fence. A front yard in a back yard — now I’ve seen everything! Some dogs prefer the simple life. 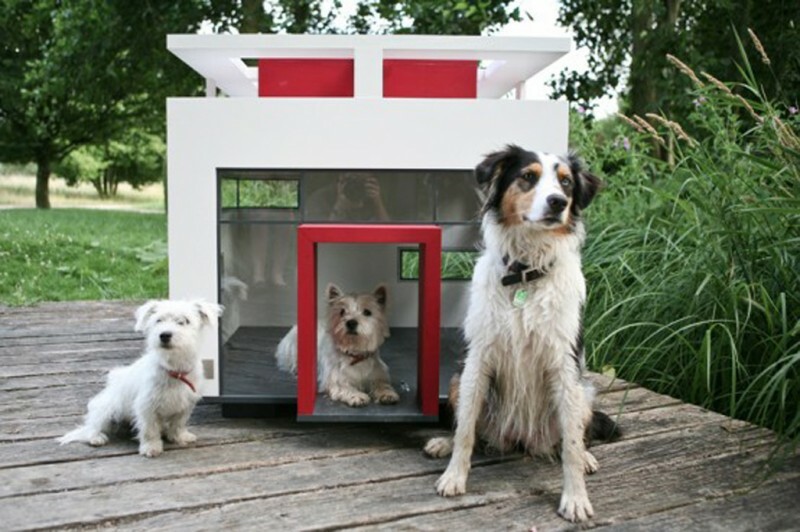 That’s why luxury doghouse maker Best Friend’s Home created this structure in the style of a Scandinavian farm house. With weather-resistant paint and real bitumen coating, this house is built to last. Those classic lines are ruvvly, aren’t they? Let’s get a dog’s eye view of the interior. Inside, the home is finished with a woven flannel pooch pad. Looks comfy, don’t it? And the window glass is shatterproof, so ruff housing is a-okay! 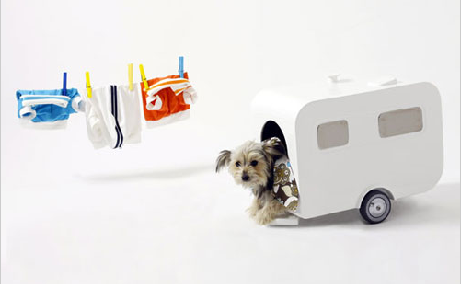 This is the Nomad Dog Home, part of Italian artist Marco Morosini’s “Dog is a God” series. (A concept in which this particular canine host wholeheartedly believes.) Each work in the series pays homage to a different aspect of doggie deification. This particular piece celebrates the traveling dog. 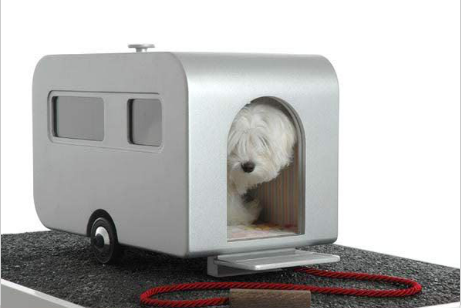 Once the nomad dog is inside, the home can be pulled along by the dog’s slave owner. So about that walk we were going to take? Yeah, it just became a ride, but I prefer to think of it as an adventure. This here is a slice of canine americana. 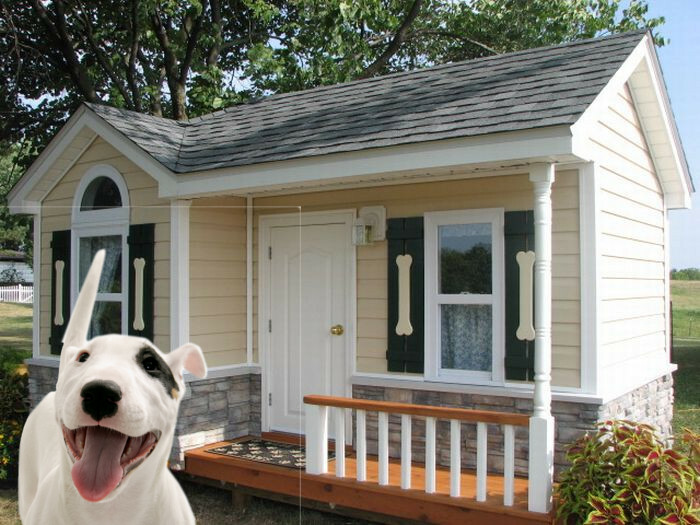 A beautiful ranch style dog home made of real, high-quality lumber and stone siding. I love the bone decoration on the storm shutters. Real fine work! 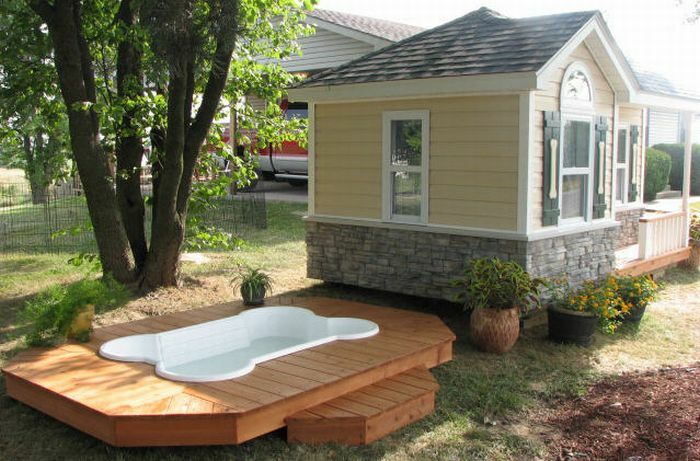 Of course, no doghouse is complete without a private doggie pool for summertime lounging. This thing is pawsome! And in the winter, the pups can enjoy an ice skating rink. The inside is finished with the same level of craftsmanship as the out. 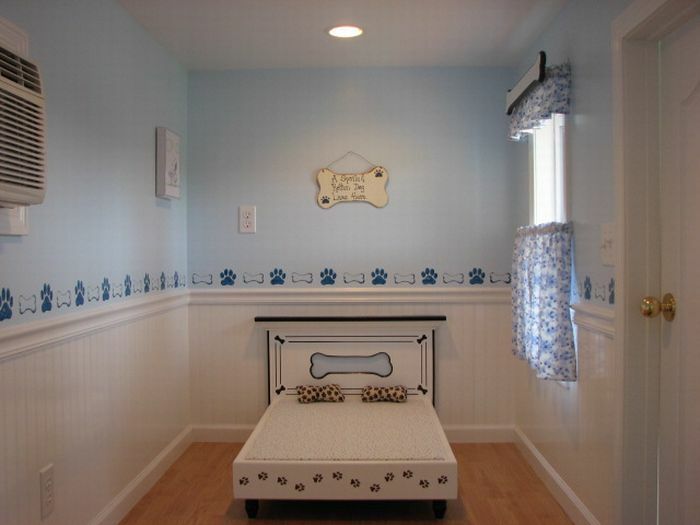 Wood floors, wainscoting, a chair rail, doggy decals on the wall paper, a custom dog bed, and even an A/C unit. Everything a dog needs to be comfortable. Gather round, web hoomans, this is a cool story. 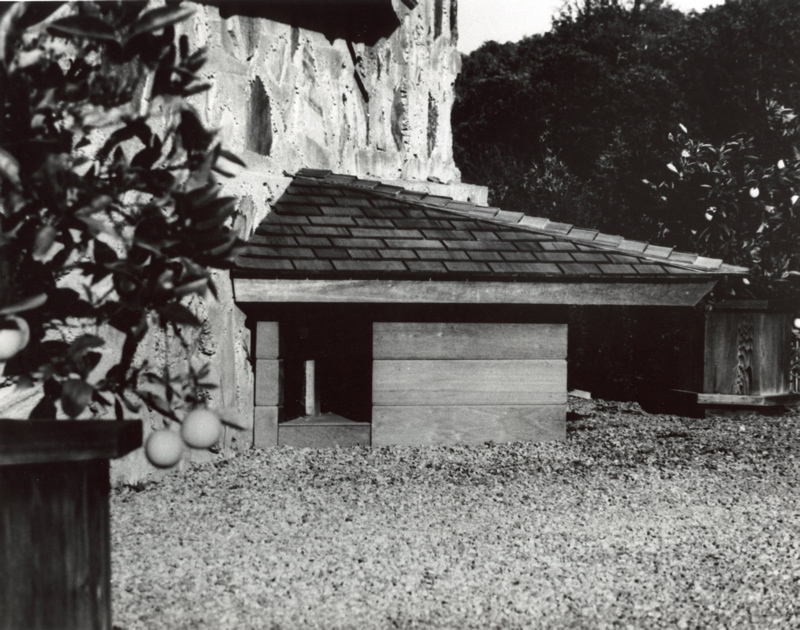 In 1956, a twelve year old boy wrote Frank Lloyd Wright and asked him to design a doghouse for their family’s labrador retriever, Eddie. Wright was busy designing the Guggenheim but asked the boy to write the next fall. The boy did, and Wright delivered, sending plans for the above dog house. 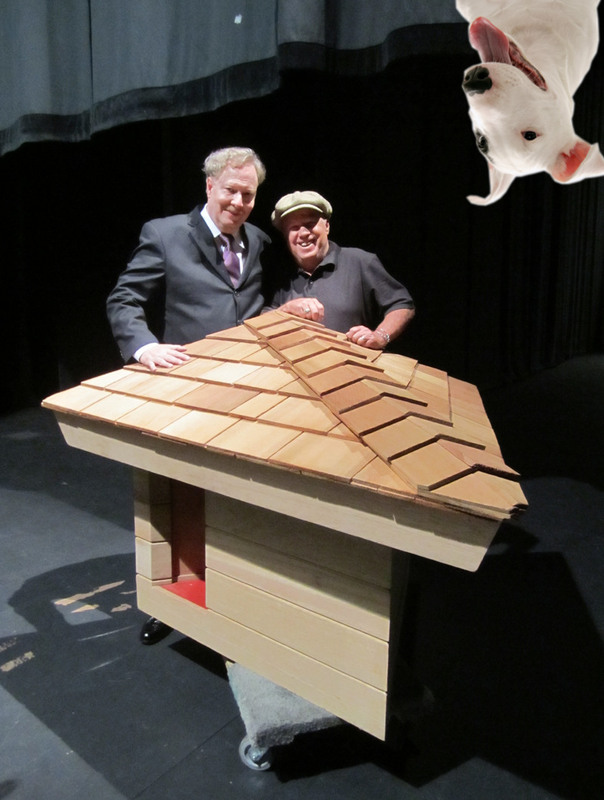 Years later, the boy recreated the doghouse to accompany a touring documentary about Wright’s work in California (that’s him on the right). Personally, I think it should have been a dogumentary, but that’s just me. 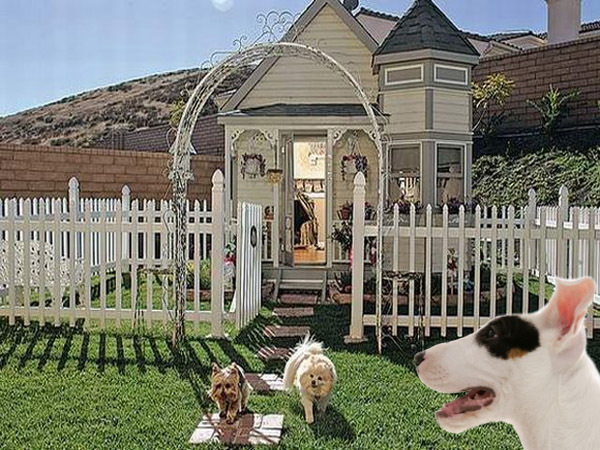 Still, this is finest example of Prarie School of Barkitecture in existence. Speaking of Barkitecture — A doggie design movement is sweeping the country and raising money for dogs in need. Barkitecture events challenge architects, designers, and builders to create dog houses to be auctioned off for charity. Proceeds go to area shelters and rescue groups. I just can’t miss a pawportunity to help a fellow dog in need. 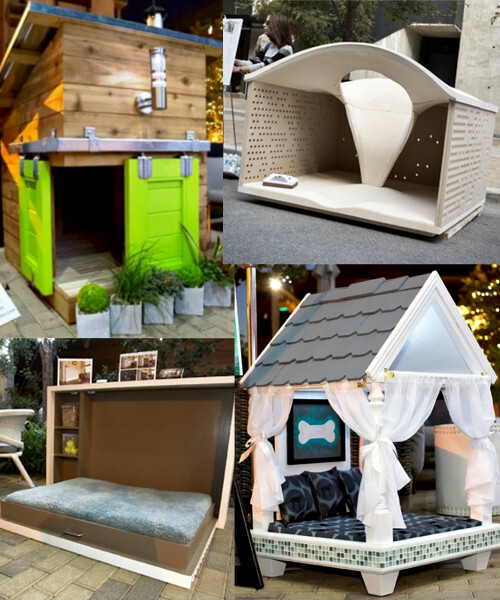 Check out some of the winning designs from Barkitecture 2012 in Austin, Texas. 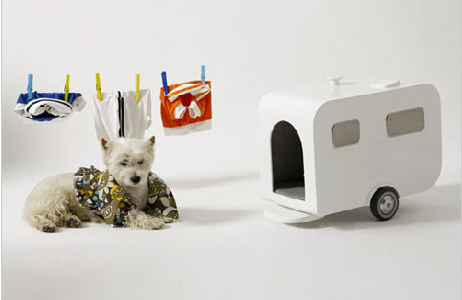 These doghouses are puptacular! 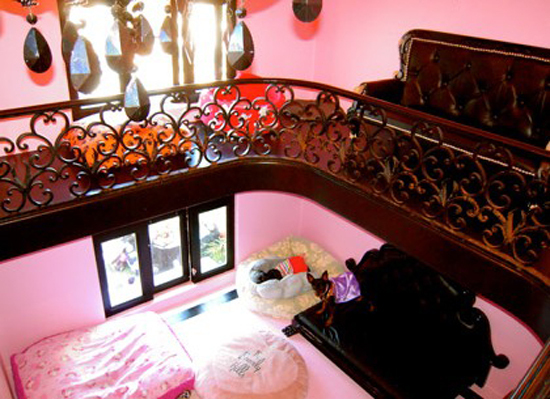 You are looking at the world’s most extravagant puppy palace owned by none other than Paris Hilton. 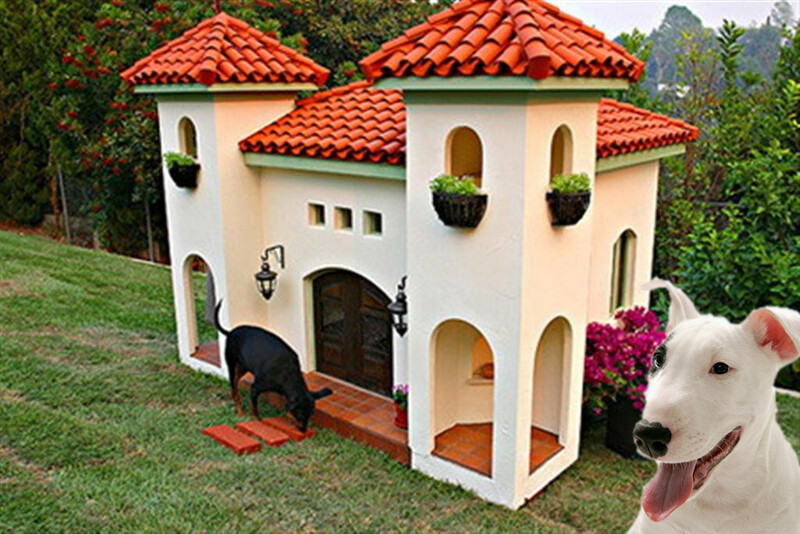 The $325,000 doghouse is a mini version of Paris’ own mansion. The house is two stories, features a juliet balcony, clay tile roof, copper gutters, and custom light fixtures. 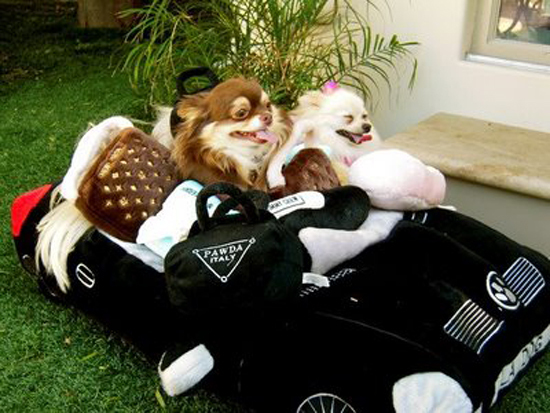 The inside of the doghouse was designed by interior designer Faye Resnick using premium materials. There’s even a chandelier. And, of course, each of Paris’ 6 pups have their own luxury dog bed. 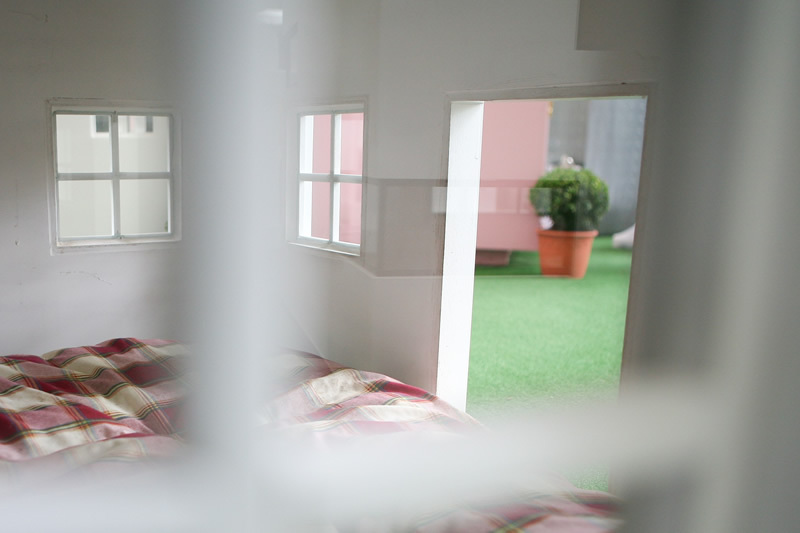 The house is also furnished by faux designer pieces from Jimmy Chew, Pawda, Sniffany & Co. and Chewy Vuitton. Now, I’m all fur being pampered, but this strikes me as a little paw-pulent!